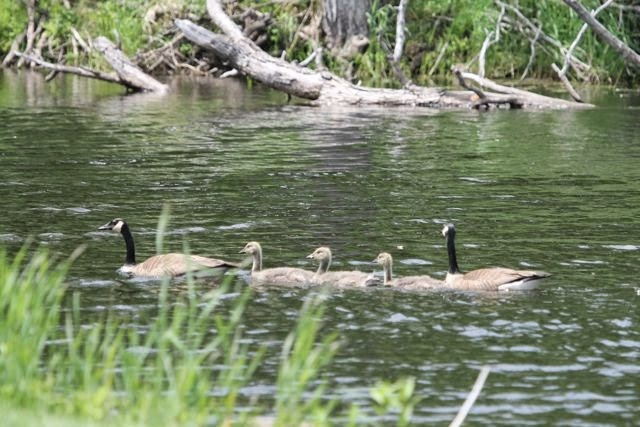 Cottage Country Reflections: ♪♫ ♬ Shall we gather at the river? 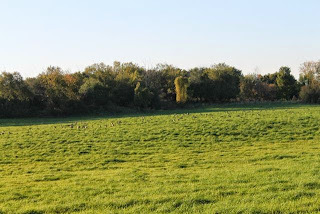 ♪♫ ♬ Shall we gather at the river? 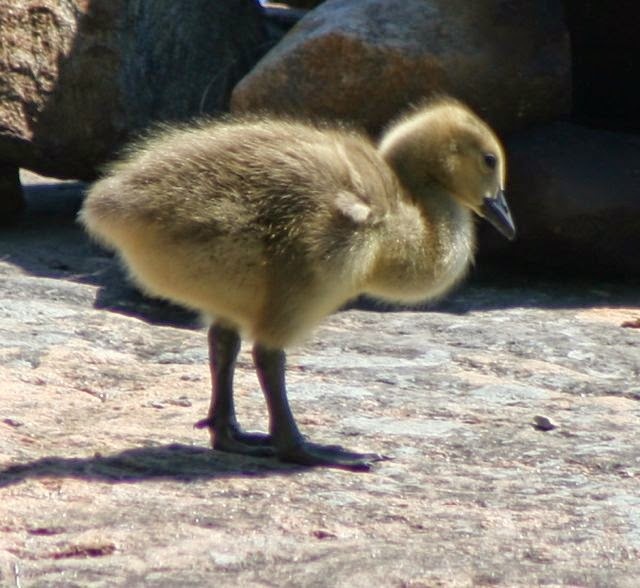 Yes, the gosling have grown. From eating grass beside the rivers, they are flying further afield! Now they fly off with the flock to load up in the fields. 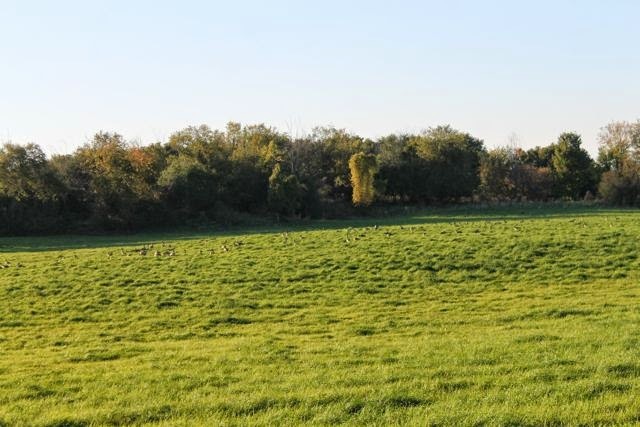 These are on Port Elmsley road, in the field. Hunting season has begun. The cats were afraid to go outdoors with all the shooting in the distance. It's that season again. From where the sounds are coming from, I think they are trespassing! I cannot imagine Ian Millar's horses are happy, either. I think it is duck hunting season, but I'm not sure! 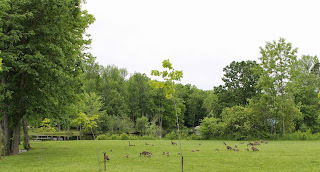 These are from my archives, when we lived beside the lake. It's like a Sunday afternoon walk with those gosling going out with their parents. Have a good weekend. sweet geese. i hope you all stay safe in hunting season. 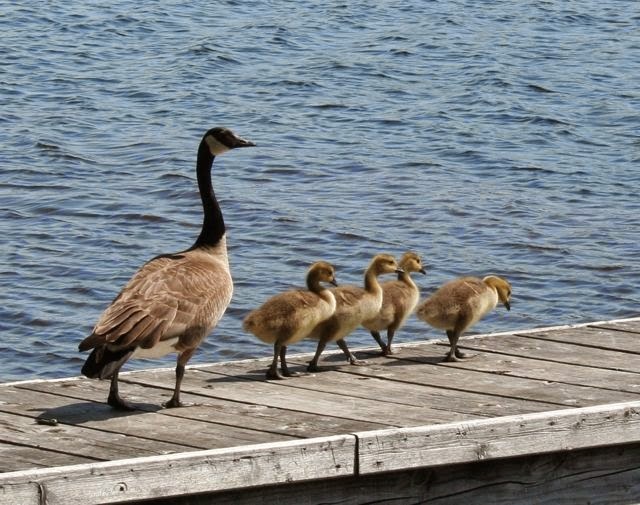 Love the photo of the geese on the dock! Great shots! 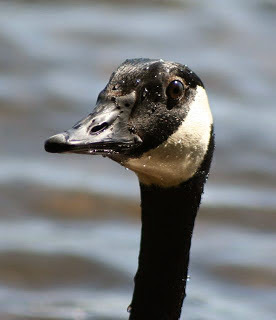 Great close up of the wet goose face! 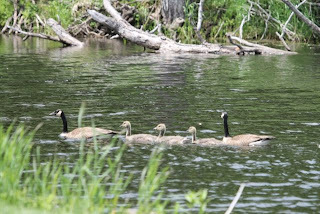 And I love all the gosslings in a row! 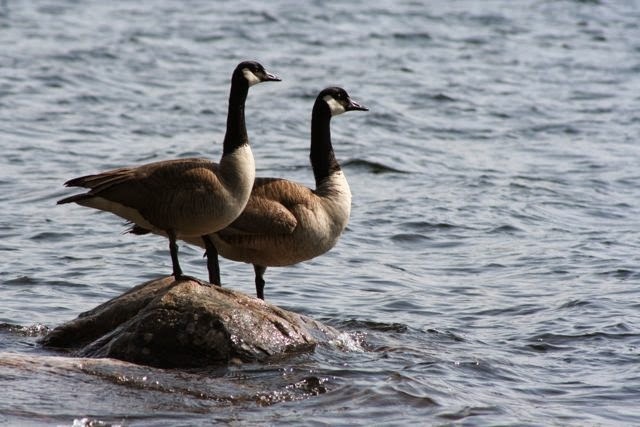 Beautiful geese. 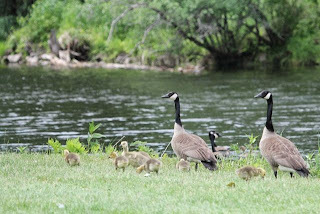 The goslings are adorable, but they grow so quickly. 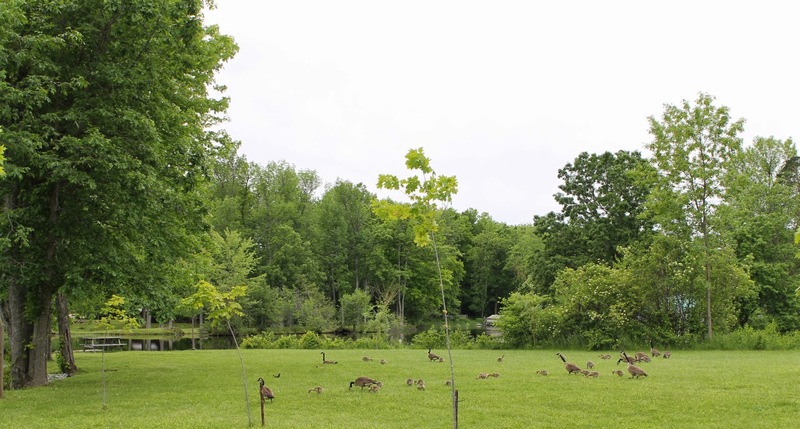 Wonderful to see the geese! What a nice visit to the lake. Cute goslings, even if they do tend to make a mess! 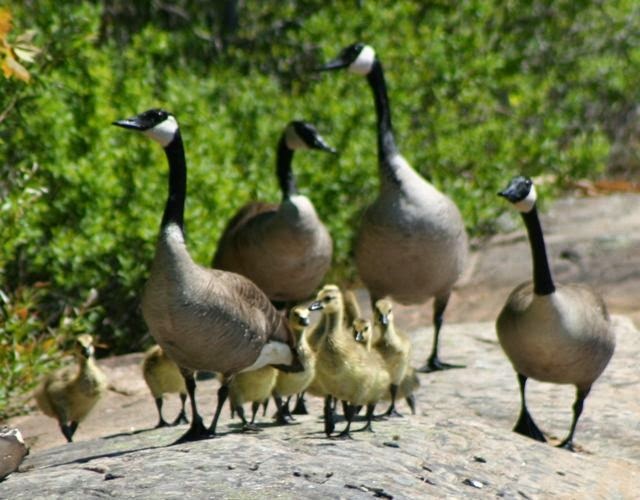 I love the cute goslings and the geese family.. Cute photos! Thanks for sharing your post, happy weekend to you! PS, I changed my post crediting you for creating the photo badge. We have massive numbers of Canada geese here. Some hang around until Christmas. 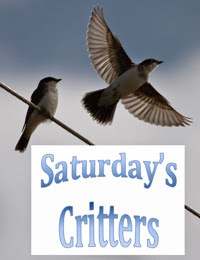 So cute and gawky -- the ones here in Oregon on the Lake (we are back from our travels) are at the same stage ... they were little fuzz balls when we left in June. I see the Canada geese flying over my house, honking, in the fall and spring, but I haven't gotten to see the goslings up close, they are so cute! 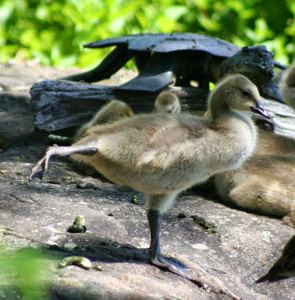 I especially like the last photo of the gosling with the confident expression, standing on one foot and stretching the other one. So adorable! Thank you SO much for sharing the beautiful pictures. Cute photo of the geese walking on the boardwalk. Your cats are smart to stay indoors or at least close to the house during hunting season!